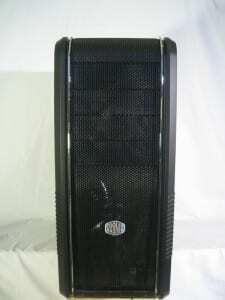 Cooler Master has been in business for more than a decade. 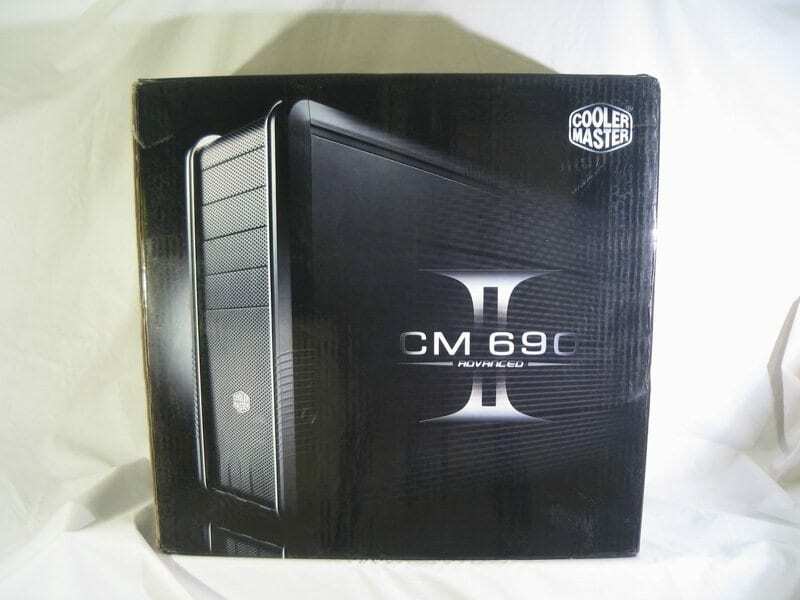 They were “founded with the mission of providing the industry’s best thermal solutions.” The Cooler Master CM690 II Advanced that we’ll be looking at today, which is a significant update to the venerable CM690, a budget champion for wire management with superb airflow, aims to push them further toward that mission. 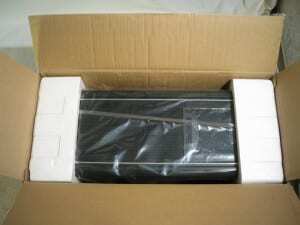 The box arrived as it would when purchasing it from a store with no additional box or padding around the case’s own box. As you can see, it didn’t need any and survived the trip through UPS’s system quite nicely. 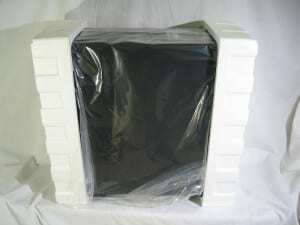 The box is strong and the styrofoam floating the unit inside is ample to protect it in transit. 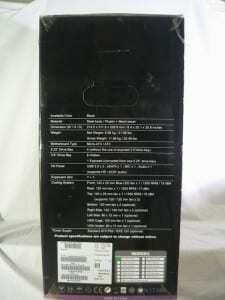 Includes 1.8″ & 2.5″ HHD and SSD adapter. Removing the packaging material we’re met with a very nice, if slightly understated case. The lines are smooth and elegant. 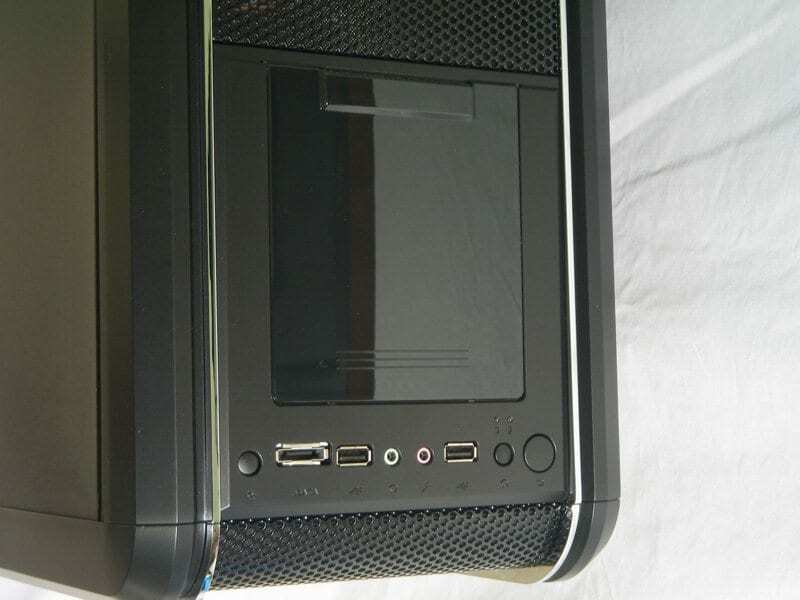 Starting with the top of the case, you can see the mesh over two fan locations to the left and the external HDD bay cover (Advanced version only), external I/O and power/reset switches to the right. There is a third switch to the left that turns the LEDs of the front fan on and off, which is a nice touch. 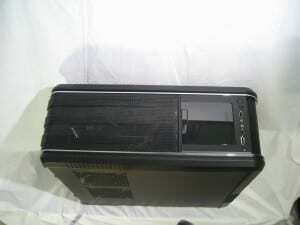 Moving around the rest of the case, both of the side panels are an unassuming semi-gloss black. When handling them, it’s very obvious they are stronger, heavier and better built than the original CM690. The semi-gloss paint on the entire case is solid and can take some minor (non-sharp-object) blows without issue. The left (when looking at the front of the case) side panel can accommodate two 80mm, 120mm or 140mm fans. The right side panel (behind the motherboard tray) contains a mount for a small 80mm x 15mm fan to help cool the rear of a motherboard’s CPU socket. 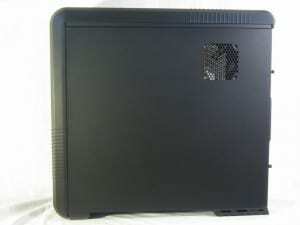 The front of the case has mesh with relatively large holes to allow greater air flow. 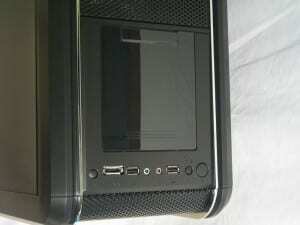 In fact, everywhere there is mesh throughout the case, it has been enlarged from its predecessor’s design – a huge boon to better air flow. The blanks that fill in the 5 1/4″ bays help keep a nice, uniform look. The rear of the case is pretty typical fare with a 120mm exhaust fan, bottom-mounted PSU slot, I/O & PCI-e/PCI slots. 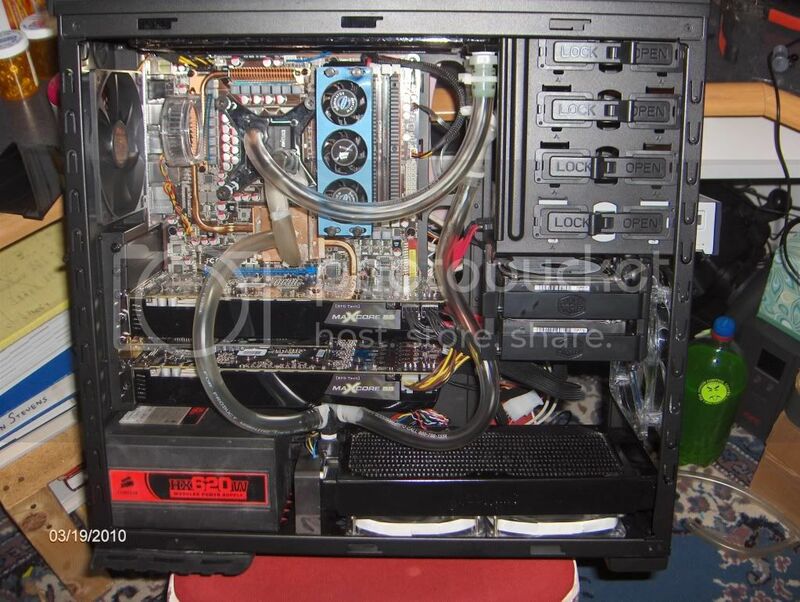 Painting the PCI blanks is a very nice touch and did not go unnoticed. There are also two holes to accommodate water tubing. These are thankfully enlarged over the previous generation, easily fitting 5/8″ OD (outer diameter) tubing. There was no 3/4″ OD tubing here to test, but as loosely fitting as the 5/8″ was, 3/4″ should fit without issue. The previous generation had difficulty even fitting 5/8″ through the grommets. 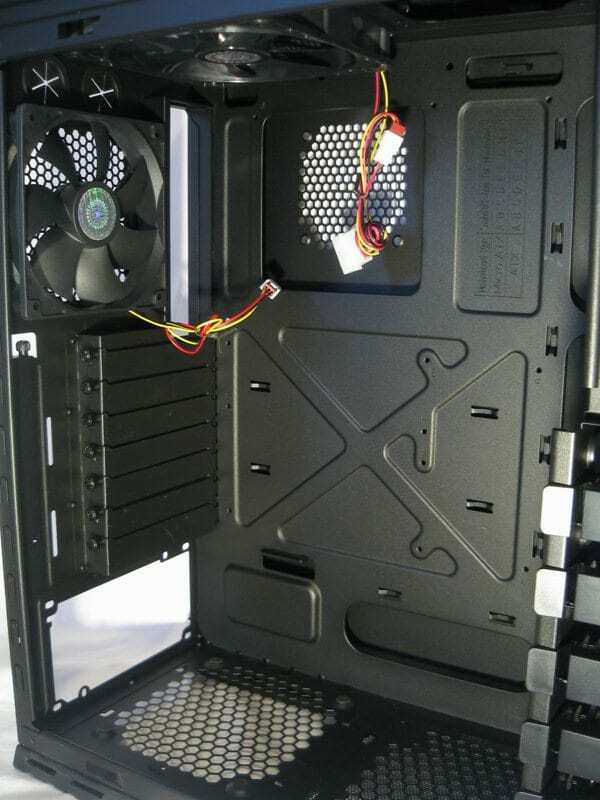 When you first open the case, you see the box of accessories, which contains the standoffs, screws, a filter to place under the PSU intake fan and an interesting GPU bracket. After removing the accessories box, you can see the inside of a well painted case. The finish throughout is the same texture and color as the side panels. Again, the paint feels very solid and shouldn’t easily scratch or chip with normal use (provided your normal isn’t ham-fisted). 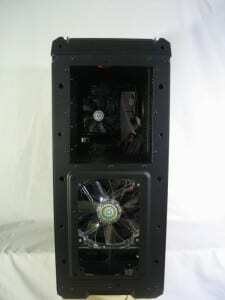 There are three fans included, one 120mm on the rear, one 140mm on the top and a 140mm with blue LEDs in the front. The front fan can be left as-is or moved down to another configuration. 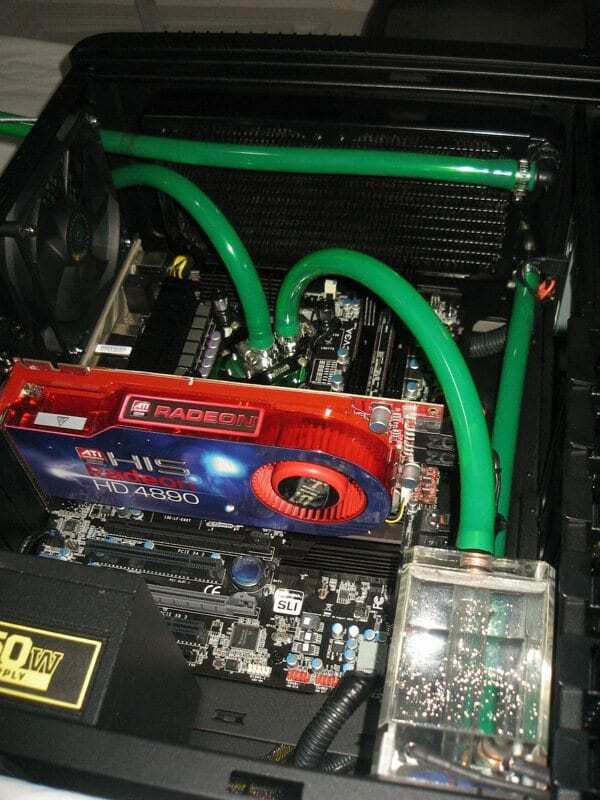 Whichever will suit your cooling needs better; a nice addition for versatility. 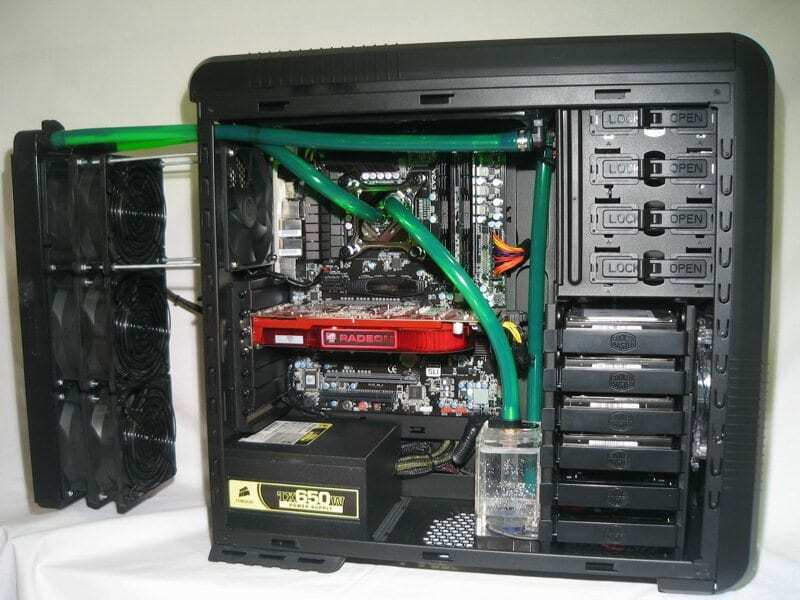 While there are six HDD bays, the fan can basically reach four of them. 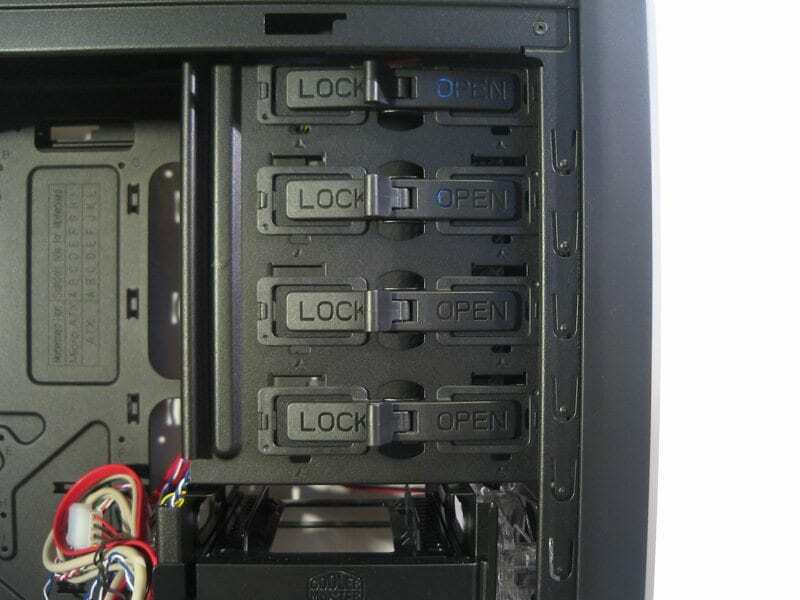 Take your pick of whether it will cover the top or bottom drives. 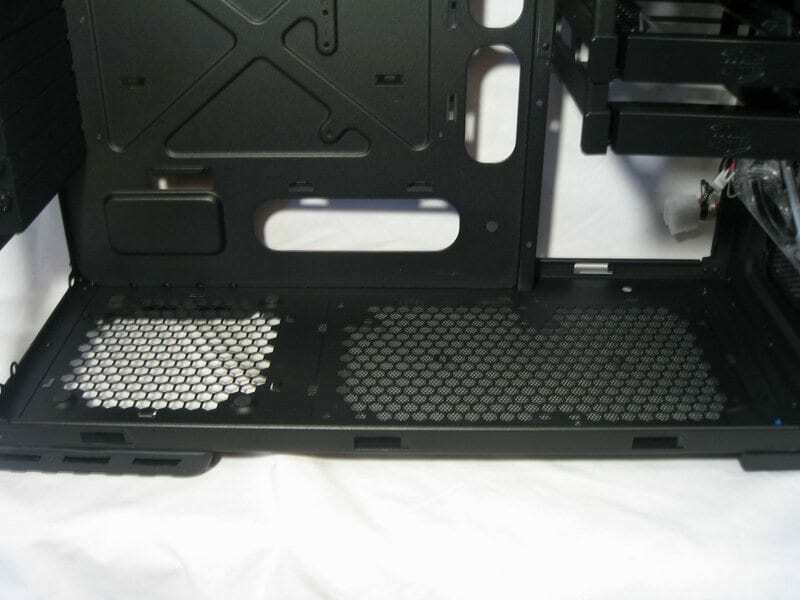 There is a convenient CPU retaining hole ﻿designed to be behind the CPU socket for easy heatsink mounting. Unfortunately the design may not necessarily work for all motherboards, but more on that later. 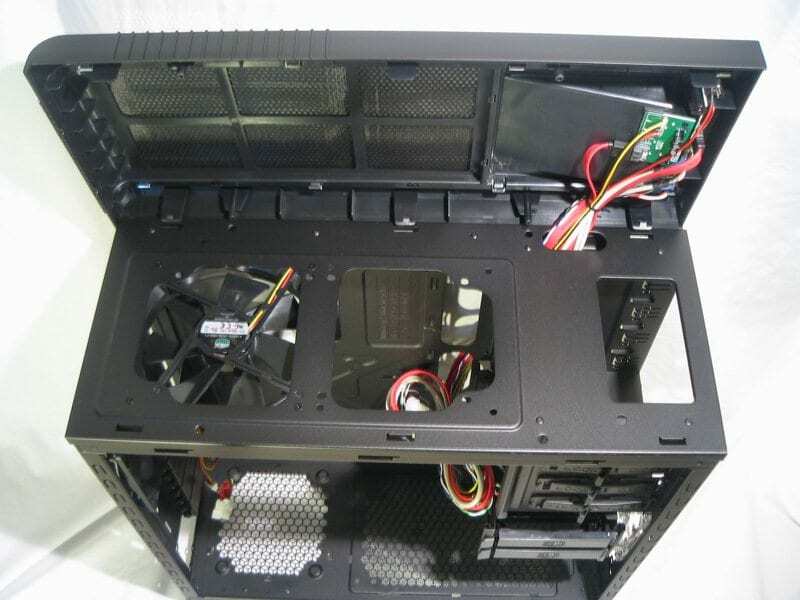 Taking another look at the top fan configuration, there are spots for two fans, either 120mm or 140mm. It’s nice to see there is no additional, unnecessary mesh here either. 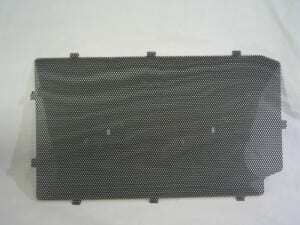 The only mesh restricting airflow (and not very much because of its improved spacing) is the external cosmetic mesh. 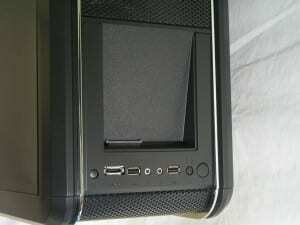 There is room between the top cover panel and the top of the case to fit 25mm thick fans. 38mm thick fans don’t allow the panel to snap on, so there is a small limitation there. 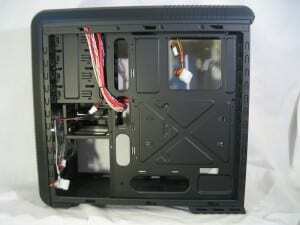 Cooler Master designed this part of the case to fit a 2x120mm radiator. Placing two fans on top and a (thinner) radiator underneath is a great way to have internal water cooling in a mid-tower case. It’s a rarity to have a mid-tower designed for an all internal water solution, so kudos to Cooler Master for making that happen. 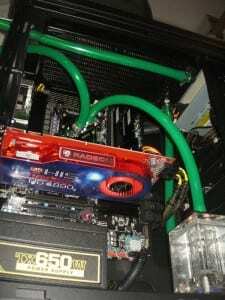 But wait water cooling fanatics, there’s more! 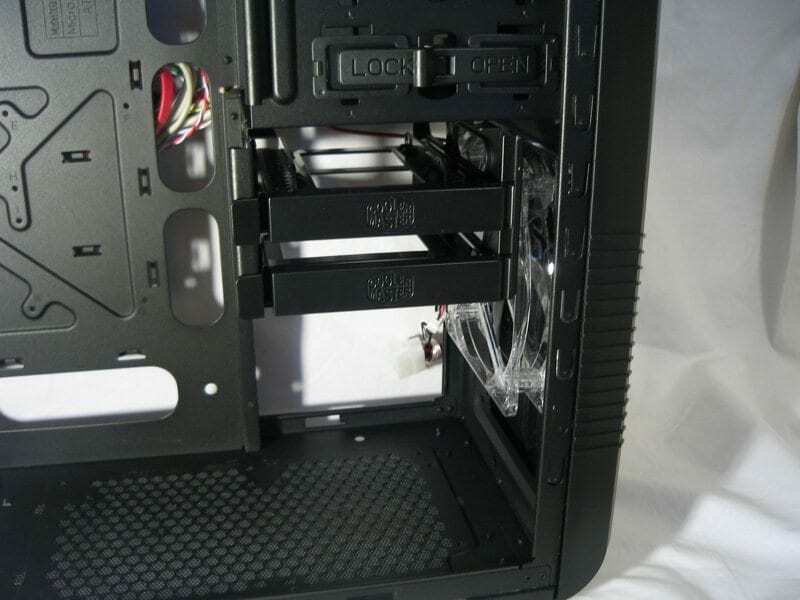 In a nice piece of engineering, the bottom rack of four HDDs is removable, leaving two HDD brackets. 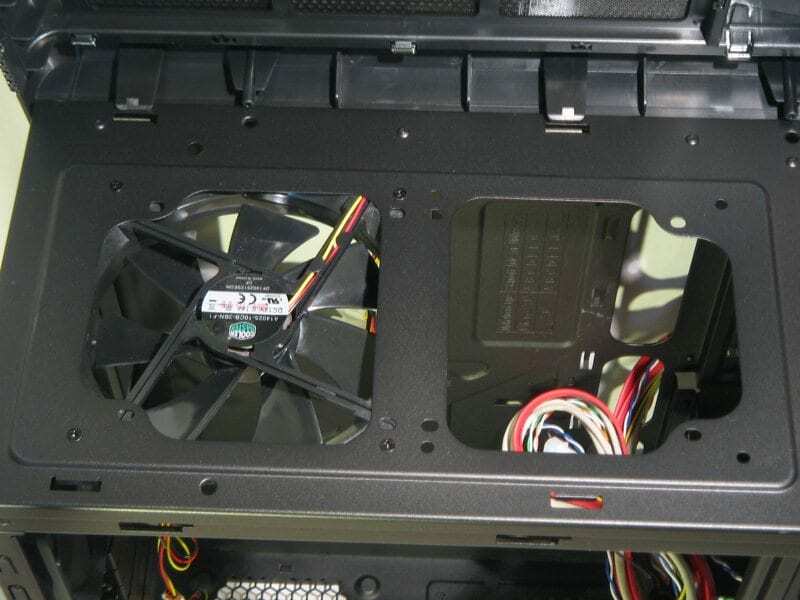 This allows two 120mm fans to be mounted on the bottom of the case, with (or without) a radiator. The HDD mounting brackets feel a lot stronger than the original CM690. 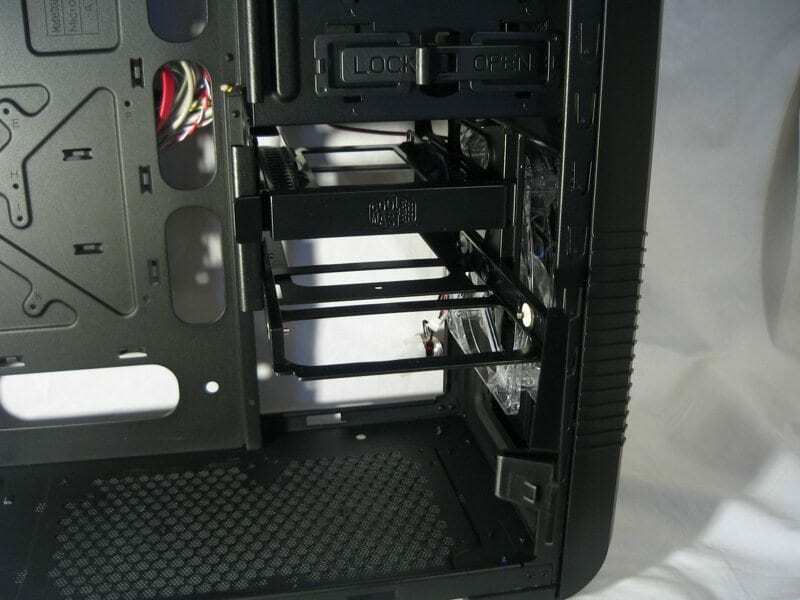 The bracket, which holds the HDD on metal rods mounted in rubber grommets, slides smoothly into the rack. It snaps into place with a swinging arm that grabs the right side and latches with the left. Click on the first photo below and click “next” two times to see it in action. Moving up a little bit, the four 5 1/4″ bays have received a new tool-free system with a simple “lock” or “open”, switch-style latch. These are surprisingly strong and easily hold an ODD without the need for a screw on the other side, (which felt necessary on the original). A screw certainly won’t hurt smaller devices with only one mounting hole (i.e. a fan controller), but you could probably get away without one if you choose. The case does come with an adapter (not pictured) to convert one of the 5 1/4″ bays into a 3 1/2″ bay for a floppy drive / card reader / etc. Turning the case around, there are plentiful wire tie mounts. This is a very welcome addition for wire management freaks like yours truly. They are in all the right places to keep your extra wires hidden from view. There are plenty of openings through the tray to thread the ends through so they come out exactly where you want them, but not so much that it’s difficult to hide wires. The space between the tray and back panel feels deeper, if ever so slightly, than the original. This is also a welcome change. It takes significantly less effort to put the side panel on with well-hidden, thick wires. 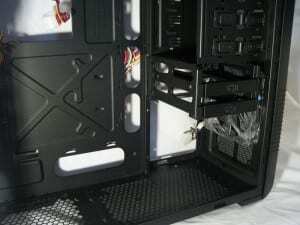 On the bottom of the case there are tall and thick rubber feet on the rear of the case and equally tall plastic feet on the front with rubber bottoms. As mentioned before, there are two fan mounts for 120mm fans on the front and middle of the case (that can also work with a 120.2 radiator) as well as mesh for the PSU fan to draw air through the bottom of the case. Like the rest of the grilles, this mesh is expanded for less restriction. 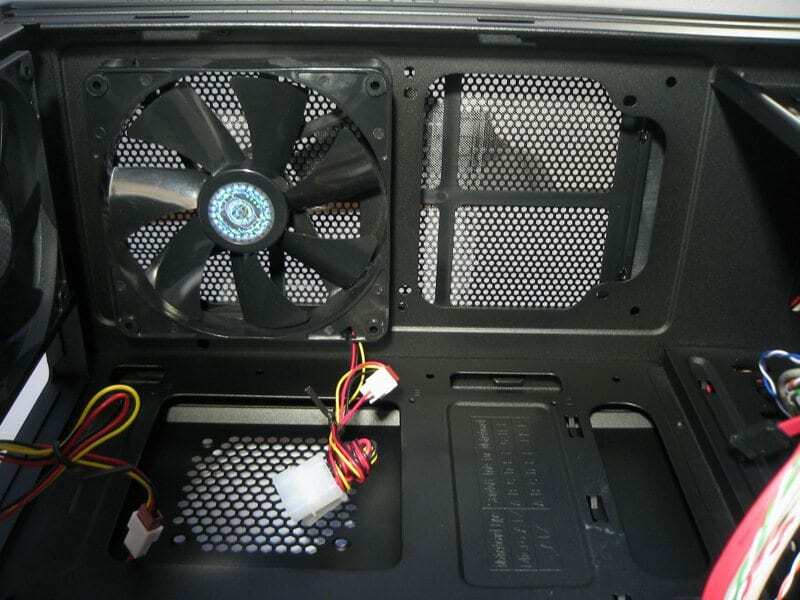 There is a dust filter pre-installed on the front two fan grilles (seen below) and an extra supplied for you to install on the PSU grille (not pictured). 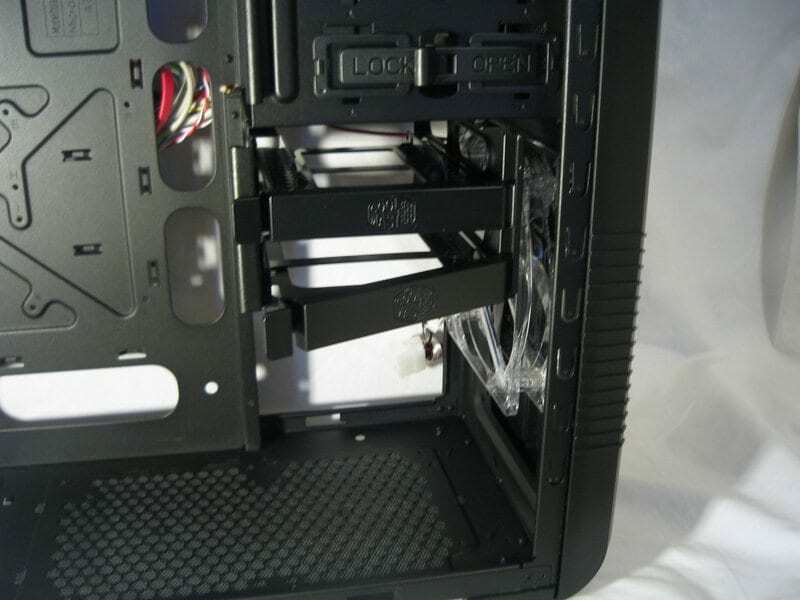 There is also a GPU bracket included with the case that we did not use as it wasn’t necessary. It’s a good design though and will treat those of you with multiple card or with a heavier multi-GPU in one card setup well. 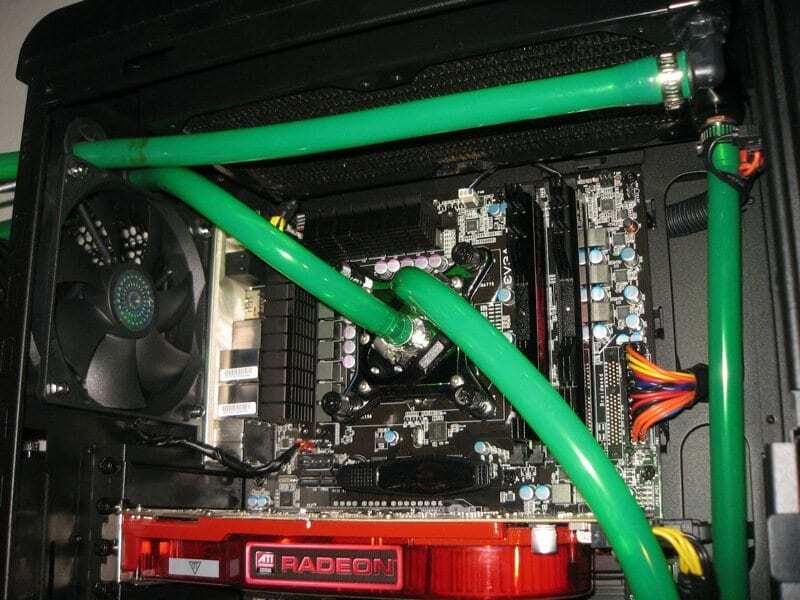 It can accommodate an 80mm x 15mm fan to assist in drawing cool air toward your GPU. Before getting started, a huge thanks goes to CrazyPC.com for supplying a Swiftech MCR-220 to explore the internal water cooling options. This case is a joy to work with. The wire management system is extremely well thought out. The holes are in the right places to aim your wires where you need them with minimal exposure and the metal is in the right places to hide them. There are wire-tie mounts galore, also in all the right places. Wire management with this case is a breeze. 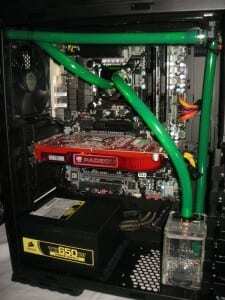 Pump: Swiftech MCP-355 with an XSPC Reservoir Top. 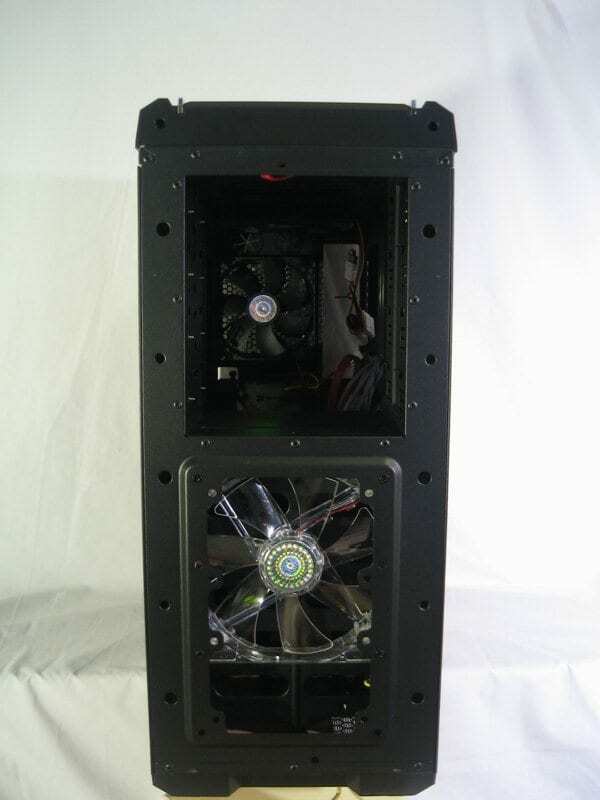 Radiator 1: Swiftech MCR-220, mounted up top with two high speed Yate Loon fans. Radiator 2: Swiftech MCR-320, mounted externally via 6″ 6-32 threaded rods with three Ultra High Speed Panaflo fans and 38mm shrouds. 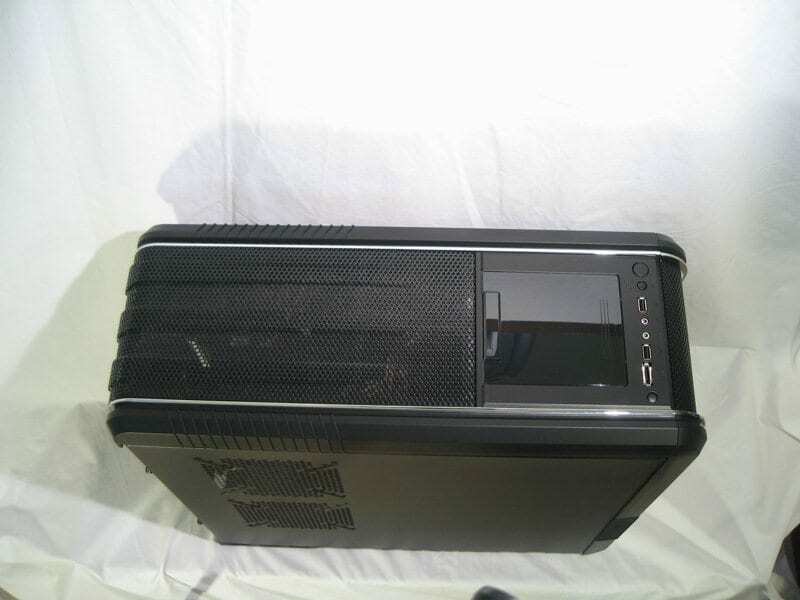 The Yate Loon fans on the MCR-220 are mounted above the case frame in between it and the top cover drawing cool outside air into the case and pushing it through the radiator. 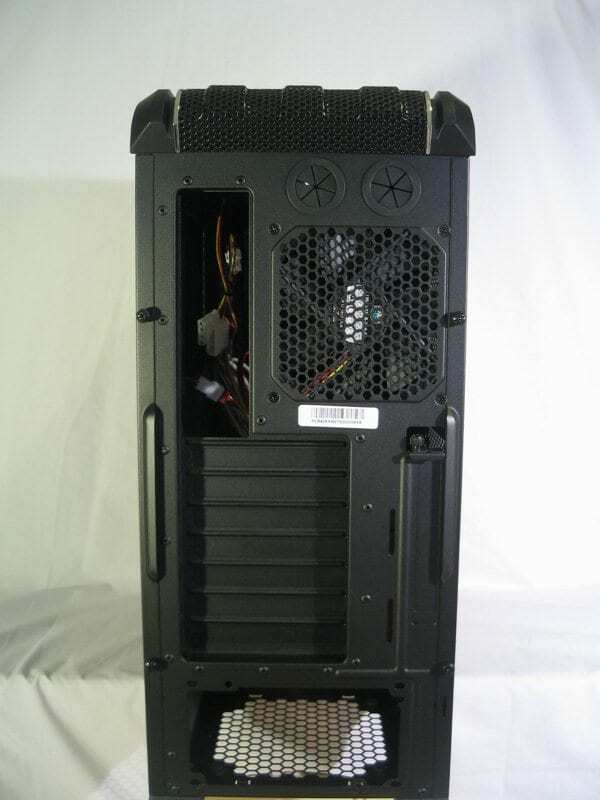 The rear exhaust fan is the Cooler Master supplied 120mm fan and the side panel (not photographed) received the 140mm fan that was originally mounted on top of the case for use as an extra exhaust fan. 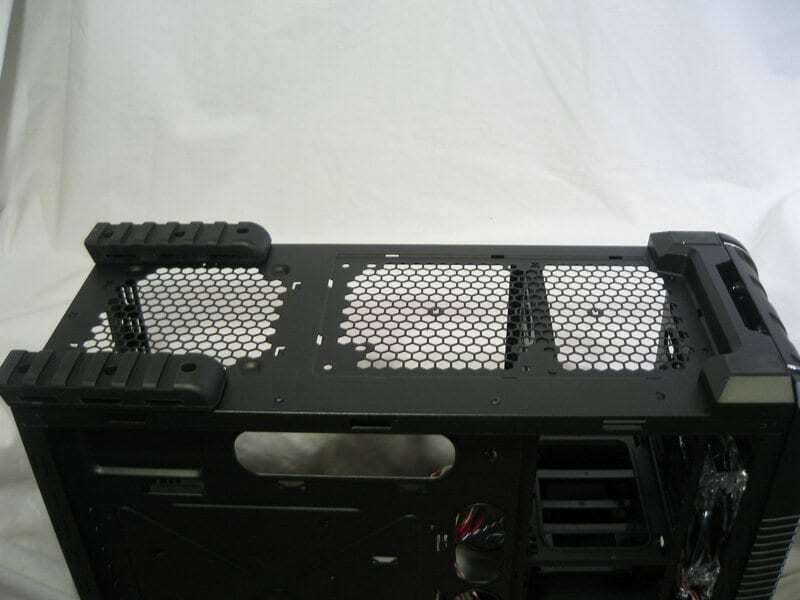 In order to mount the MCP-355 and because there weren’t going to be any fans down there, the bottom air filter was removed. 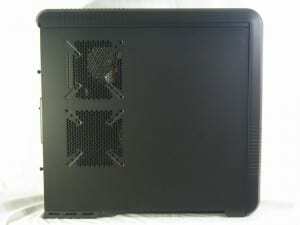 Note that you will need some extra washers to mount something through the enlarged mesh on the bottom of the case. The bolt is 3/4″ 6-32 with a a #6 and a #10 washer to keep it from pulling through. Enough talk though, let’s look at how it turned out, shall we? We’ll start with the back of the motherboard tray/HDD bays to see how the wires were actually run. 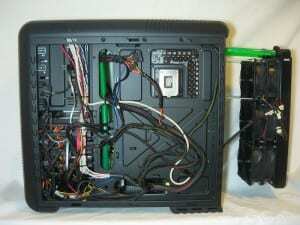 As you can see, the wire tie mounts are in all the right places to tame this non-modular Medusa of a power supply. Four of the six HDD bays are filled starting at the top, one under another. This left two HDD bays unused for some extra hiding space. All told, we went through the greater part of a 100-pack of 4″ wire ties. One negative that was touched on earlier is the rear access hole for use in heatsink installation. Having the hole just a little bit bigger would have been perfect. 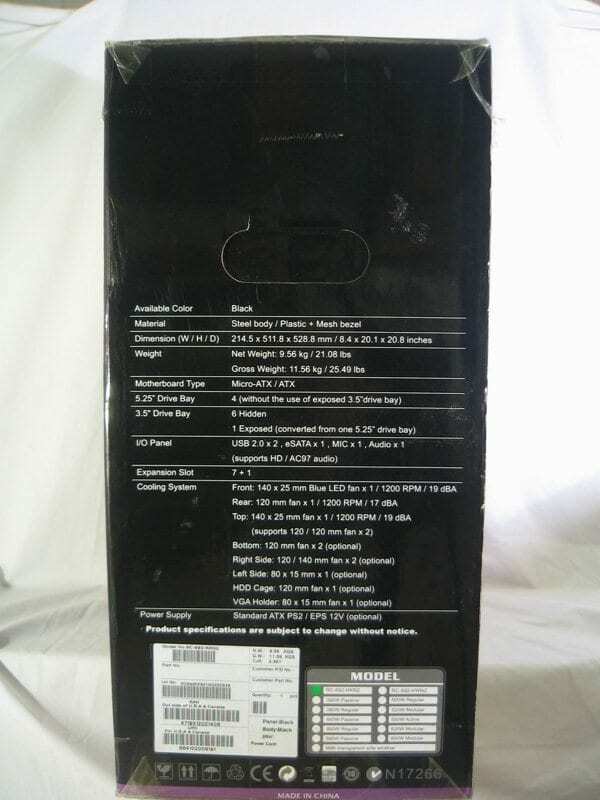 Unfortunately, it doesn’t fit the bill with this EVGA P55 board. You have to either mount the heatsink (or waterblock) before putting the board in or remove / loosen enough mounting screws (meaning pretty much all of them, one way or the other) so that you can maneuver the board out far enough to get the HS mounting plate in there. This is one of the few drawbacks to this otherwise superb case. Now we’ll look at the fun photos and see how that mess in the back turns out in the front! There you have it, installed and wire-managed. As you can see, the control you have over the wires translates very well to an extremely clean interior. 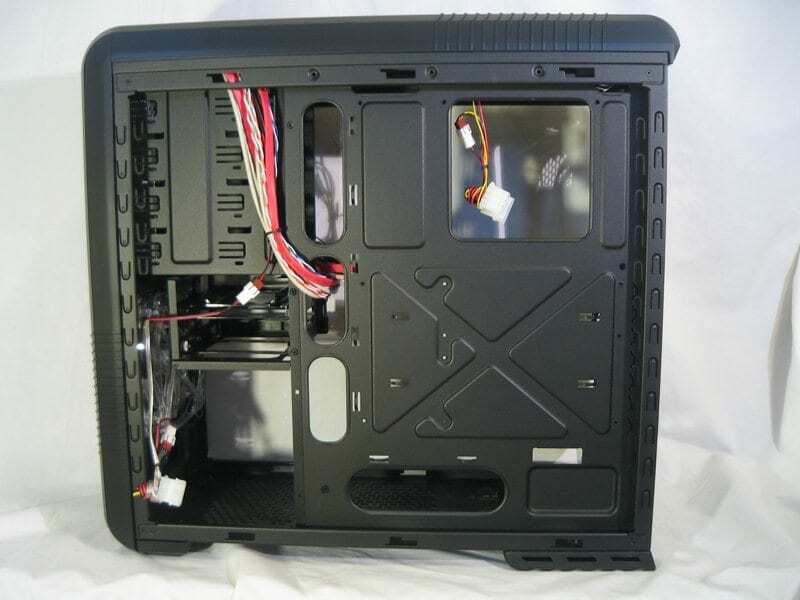 Not only does this look a lot better, but it allows for great air flow inside the case to keep all of your components nice and cool. Let’s not beat around the bush and get straight to the nitty-gritty! 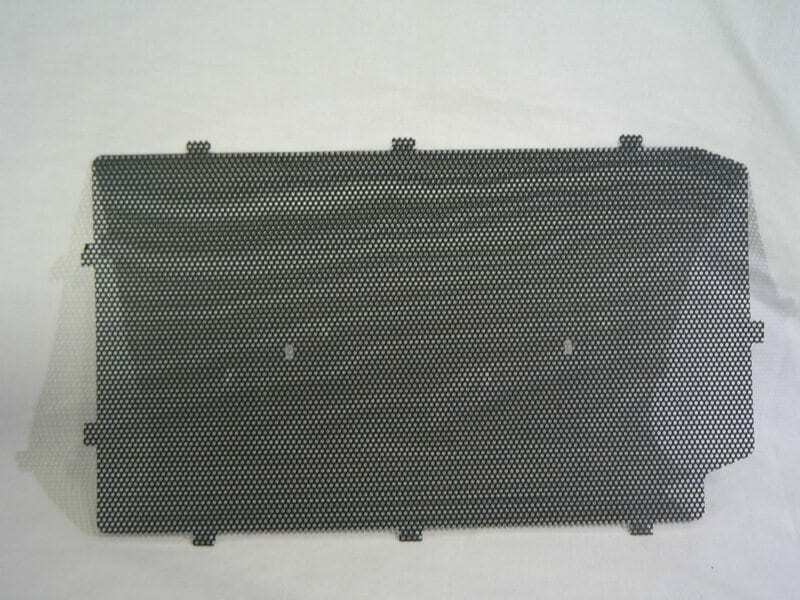 Excellent fan grille mesh design allowing for better air flow. 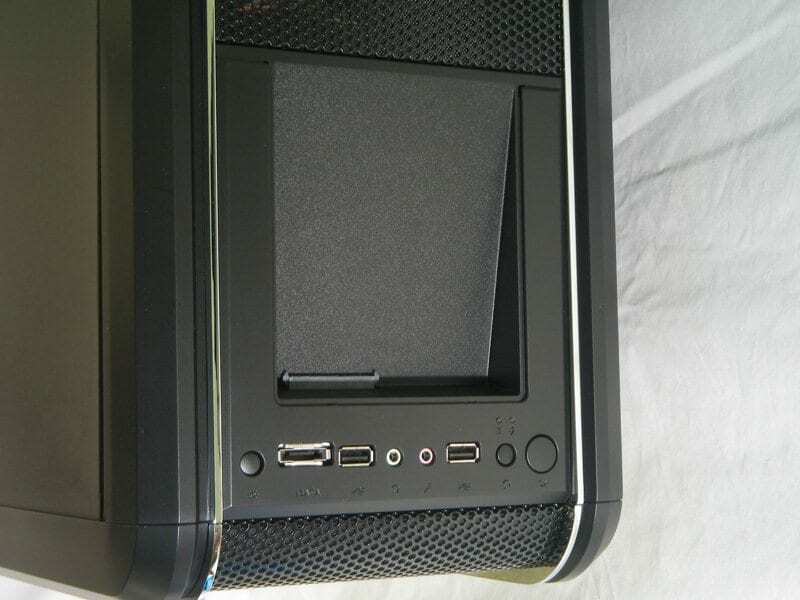 No extra layer of mesh where the fans underneath the cosmetic covers mount to the case frame (this was an issue with the original CM690). Stout tool-free 5 1/4″ bay mounts. 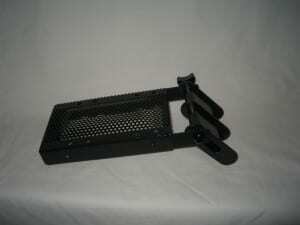 Sturdy HDD trays with rubber mounts to dampen vibration. 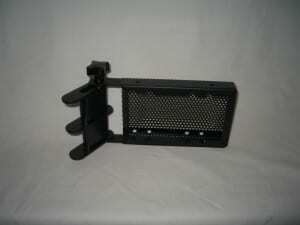 One 2.5″ adapter for SSD mounting included. Thicker, stronger side panels (than the original CM690). Improved I/O and switch placement. Larger grommets allowing for easy passage of thick water tubing. 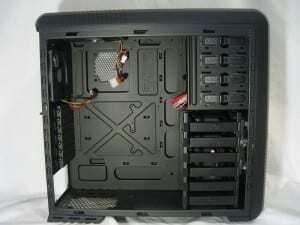 CPU retaining hole isn’t large enough to accommodate common socket placement. 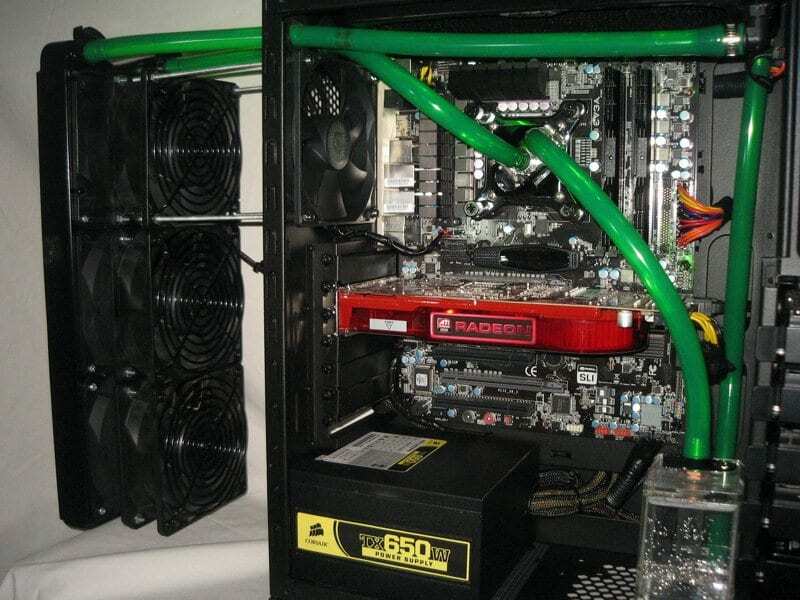 A couple extra fans would be nice. 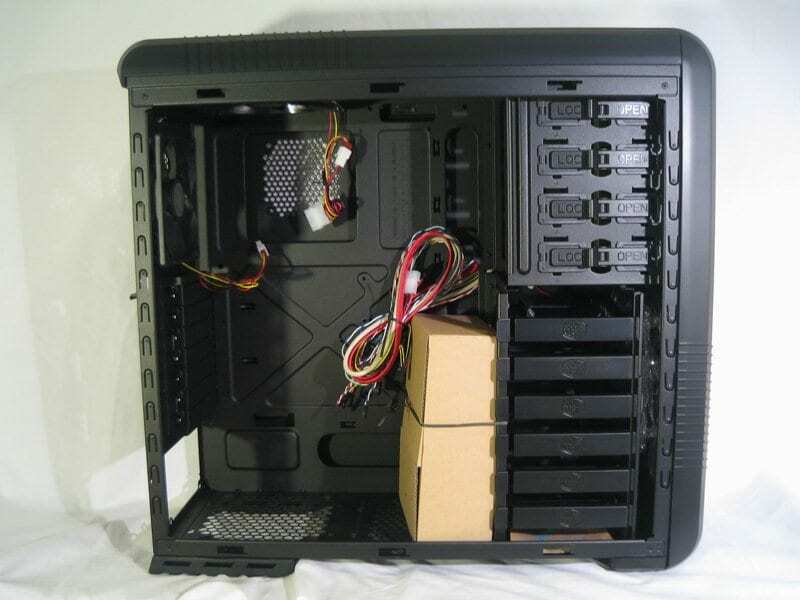 While we wish this case had a side panel to show off the glorious wire management that can be had, that’s not that big of a deal. A bigger deal is a heatsink mounting hole that isn’t big enough to use. While having to loosen the motherboard is a whole lot better than having to remove it outright, it’s still inconvenient to mess with. If it were ever so slightly larger, this issue would be moot. All in all, this case is beautiful to behold and very easy to work with. Installation is a breeze and if you’re into wire management, it is most definitely your friend. 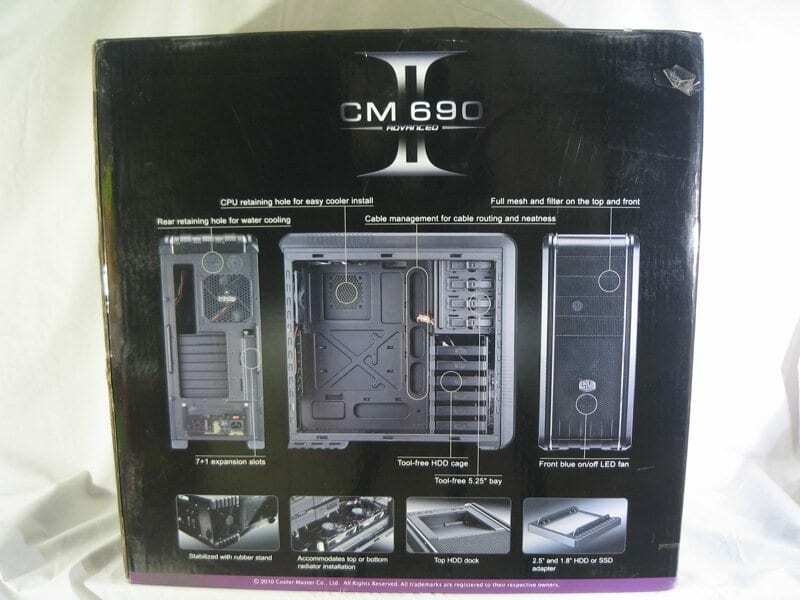 There are also very few mid-tower cases designed specifically with water cooling in mind. 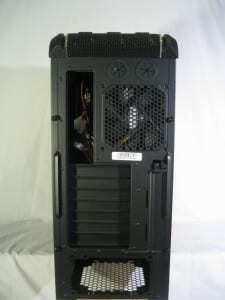 It’s a breath of fresh air to be able to put two radiators in a case without needing to step up to a full tower behemoth. Overall, we’re extremely impressed with Cooler Master’s latest offering. We could be happier, but only just – and for very minor reasons. 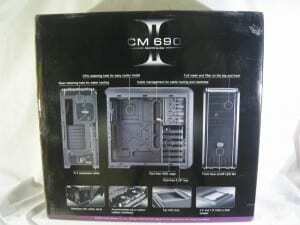 If you’re in the market for a new case, at a mere $79.99 for the CM690 II Basic and $99.99 for the CM690II Advanced, this case is worth every penny! This review was cross-posted with Overclockers Tech. 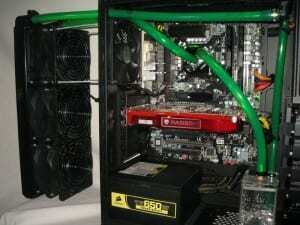 Previous Article 3 Step Guide To Overclock Your Core i3, i5, or i7 - Updated! Very good Review hokiealumnus, nicely done and informative! If anyone has any questions about the case that I didn't cover, I'm happy to answer them. Ask away! This is a great review hokie...wow!!!!!!! I've been admiring this case from afar for quite some time. Pulled the trigger today. 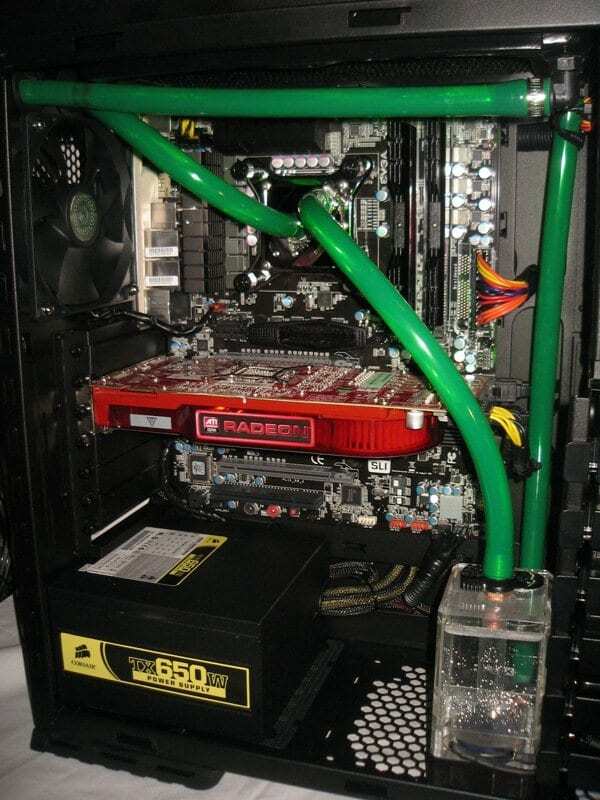 I plan on building it wiht two swiftech 220 radiators one on top and the new pump attached one in the bottom. I'll have a "Y" line for filling going up top. My initial plan is to just have two 140mm fans in the top space with the bottom rad without fans entirely. I'll post up once I've done the build with some pics. I'm looking forward to a quieter and smaller foot print system to my current Thermatake Armor beast. I'm also going to see about switching/modding the 2/4 drive bracket to 4/2 layout and removing only the bottom two if possible. We'll see. Show us pics when you're done! I got the rad, fan and fillport I ordered today but the case was shipped separately. 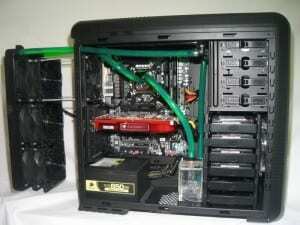 I hope to have it soon then I can start building! Ok, this is just so freaking cool. Got a W/D HDD back from RMA. Didn't feel like opening the case...so I popped that sucker into the external HDD tray, restarted and bam - new HDD. It's far from a permanent solution of course, but to test a new HDD it's far easier than having to install it and less of a pain than dealing with eSATA. So another great benefit to the CM690 II Advanced. I just touched on it in the review, but it's much cooler than I considered it at the time. Yay! EDIT - I just noticed your edit Owenator. I'd be ripping someone a new one until they refunded that extra money you paid for shipping. Regardless if they told you or knew they had to do it, they darn well shouldn't take your money for shipping they can't provide. I have used it a LOT. For instance this week: backing up a faulty laptop when the laptop wouldnt boot - removed, put in X-dock - backed up using Acronis - new drive in X-dock - restored to new drive, put back in laptop - sorted. It's just so easy and convenient. Cool! That was a big selling point for me too. Well, because I have more money than patience I actually bought another 690II from Newegg that's coming today. Woot! Hahaha...I wish I shared that problem! What are the differences between the advanced and basic model? I have 2 scythe quietdrives now for my seagate 3.5" drives mounted in the 5.25" bays. The fans I am using are pretty much silent, and am currently running stock speeds - but as the case is so well designed for watercooling it keeps making me go back and want to do it! That's one MCR220 and a MCR220 Drive in series. Awesome job Owenator!! That looks great.